Because it is lower in fat and calories, turkey bacon is often used as a substitute for pork bacon. While turkey bacon contains less fat and calories than pork bacon, it is similar in cholesterol, mineral and vitamin content. For example, a 1-ounce serving, which is approximately 2 slices, of turkey bacon contains 0.051 milligram of vitamin B-6 while the same serving of pork bacon contains 0.056 milligram, both of which work out to be approximately 4 percent of the dietary reference intake, or DRI. The calories in turkey bacon come primarily from fat. One serving of turkey bacon contains 4.5 grams of fat, which account for 40.5 of the 61 calories in each serving. Although this is a high percentage, 66 percent, of fat calories, turkey bacon is lower in fat than regular pork bacon, which contains 6.6 grams of fat per serving. Pork bacon is also higher in calories, with 86 calories per serving. Of the 4.5 grams of fat in one serving of turkey bacon, 1.3 grams are saturated fat, 1.7 grams are monounsaturated fat and 1.1 grams are polyunsaturated fat. Turkey bacon also contains 16 milligrams of cholesterol per serving, which is 5 percent of the maximum recommended intake per day. One serving of turkey bacon contains 4.8 grams of protein, which make up 19.2 of the 61 calories. This 4.8 grams of protein provides about 10 percent of the 46 grams of protein women need each day. The remaining 2 calories in one serving of turkey bacon come from the 0.5 gram of carbohydrates per serving. Like many cured meats, turkey bacon is quite high in sodium. One serving of turkey bacon contains 366 milligrams of sodium, which is 15 percent of the maximum daily intake of 2,400 milligrams recommended by the Institute of Medicine. The American Heart Association, however, advises individuals seeking to reduce heart disease to consume less than 1,500 milligrams of sodium. The 366 milligrams in two slices of turkey bacon would be 24 percent of this amount. Other than sodium, turkey bacon does not provide a large amount of any minerals. One serving provides slightly more than 10 percent of the DRI for phosphorus, which is essential for the health of your bones and teeth. All other minerals are present in only small amounts, with one serving providing less than 10 percent of the DRI for iron, calcium, potassium, magnesium, manganese, zinc and copper. One serving of bacon supplies less than 10 percent of all vitamins-both fat-soluble and water-soluble. 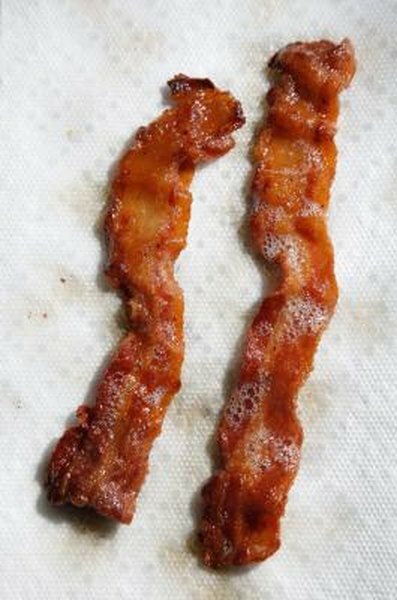 Two slices of bacon provide no vitamin C or vitamin A and less than 10 percent of the DRI for vitamin D, vitamin E and all of the B vitamins.